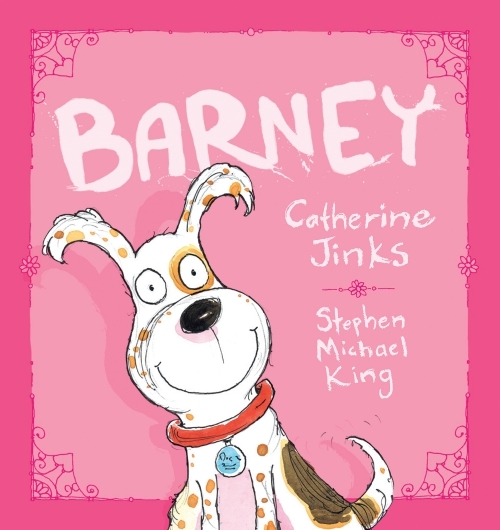 Written by award-winning author Catherine Jinks and illustrated by award-winning author and illustrator, Stephen Michael King. Nothing exciting there! I can’t remember being born! Outer suburban Sydney! My first childhood memory has my older brother David being lifted into my cot and us playing together. There’s warm light coming through a window. I can clearly visualise the room. I also have a memory where I’m standing on the back seat in our car and chewing the top of a low front seat. I must have been around one year old. I can taste the red vinyl of the old EH Holden as I talk. I now live close to the sea, on an island, in a mud-brick house. My studio is a short walk down a hill, through our orchard. I share my life with my wife Trish, our two children, three dogs (Millie, Rosie and Twiggy) and one noisy rainbow lorikeet. Again, nothing exciting there! I try not to remember. School was difficult with my hearing loss. There were a handful of exceptional teachers who could reach through, guiding me creatively, spiritually and also helpin’ me with readin’, writin’ and writhmatic! My report cards always said things like: 'quiet and shy', 'quiet achiever', 'it would be nice to see Stephen speak up a little more'. I didn’t hang out in a big group but I always had good, solid, close friends. What is the ‘naughtiest’ thing you did? Wow! I don’t think I’ve ever had a goal of being naughty! I’ve challenged authority often, but that’s always felt good! I’m not one of those people who says that the villain is the most interesting character. A truly 'good' character is far more complex. To answer your question: My mum thinks I’m a trouble-maker at times and I do like mischief. In my long ago past I regularly skipped school and was often punished for talking (whispering) in class. At the time, if I’d had a chance to defend myself, I would have said that everything was because I couldn’t hear my teachers. Too many! My parents read to me regularly. It was all about my Dad or Mum reading to me: their voices weren’t asking me to tidy my room or eat my carrots; they were tucking me in, talking, laughing and reading me into slumber. I have nothing but happy memories of going / or not going / to sleep with a book. I’m not one to judge! I like nearly anyone who writes for children, there’s only an armful of books that I’ve puzzled over. As long as children remain the author’s focus and there’s no other motive behind what’s being created then I’m happy to browse. I’m not a foodie! Simple is best: Water / bananas / Vegemite on toast / red beans and rice ... and pizza! Colour: my wife taught me that all colours have a purpose and are beautiful in their own right. All colours have their own unique visual language, even murky green-brown! I love movies and I’ve watched them all. A movie I watched recently was His Girl Friday (1940), with Cary Grant and Rosalind Russell. All my favourite movies seem to feature simple sets and great dialogue, and funny / emotive fast-talking scripts! Speaking of sets, I love Fantastic Mr Fox directed by Wes Anderson. Wes loves a good set! Stop animation is also a favourite ... on and on I go ... I’m watching some early Charlie Chaplin (did it ever get better than Charlie?). My mum was a teacher and she wanted me to be a great reader. Maybe that’s the ‘naughtiest’ thing I’ve ever done; become an illustrator. My Mum or Dad didn’t draw, so drawing was a place I could truly be me. Near the end of school and into my late teens my parents were suggesting that I work for a bank or become a salesman. They didn’t understand 'my art', so creativity became a free, inspiring and self-motivating place to be. Art was something I tried to shake off. I tried to procrastinate on starting my creative life, but my creative self couldn’t sit still. Life would have been easier if I could have become a sales person or a banker. Becoming an illustrator was two steps back, one step forward. The biggest challenges aren’t writing, drawing and painting, they are: believing in yourself, finding the strength to expose your deepest emotions then allowing them to be judged. There was one more for me: acknowledging that I was worthy. Truthfully, I had no choice. Having hearing loss meant that I had to draw for my supper whether I was worthy or not. 29 when I was first published! Before then I worked for Burbank, Walt Disney and my favourite jobs ever: a general library assistant (Macquarie University) and a Children’s library Assistant (Ryde Library). I wanted to be a mad passionate artist, then I realised that books had been my gateway to everything. I couldn’t avoid my inner illustrator; he chased me down. Ideas come from places where judgement doesn’t exist, liquid, free places. Right or wrong can’t even breathe in truly creative spaces. Ideas are about exploration. Creativity is about recording and celebrating your discoveries. Anywhere is perfect: train, car, lounge, verandah or desk. I will say: if you want to be an artist, create a space for yourself. Cooks have kitchens; artists have studios. You deserve it. If you’re an artist and you have a kitchen but not a studio, I suggest you cook outside with the sun, rip out you kitchen and reclaim it as a studio. My Dad worked from home (insurance salesman). I work from home. A lot of people think you need to be at the office every day, but I enjoy being in my own space and not having to deal with angry bosses. I surround myself with people I love and who love me in return. In my job I rarely wear shoes. I only dress up for fun, if we’re going out or celebrating birthdays etc. When you live in a mud brick house on an island, the simple act of dressing up can be an event. It’s a serious business, no laughing allowed! It varies from year to year, season to season. I like to appreciate what I have. I don’t ask for much: a skateboard, a push pike, a dog to walk on the beach; looking at billowing clouds and country night skies; sitting on my verandah during a storm; and sharing it all with my family are my favourite past times. I removed choice from the equation. All my eggs went into one basket. If I hadn’t been published I would have chosen a quiet part-time job where I had plenty of time for dreaming and creativity outside of work. I don’t think about the past much more than answering these questions. I’m usually projecting to my next project or story idea. I guess I’d go for someone who could possibly change my path, a fork in the road kind of person: Mahatma Ghandi ... Leonard Cohen. If my Dad was still alive I’d like to talk to him about Mahatma Ghandi and Leonard Cohen. Drawing is how I speak best.